Regardless of which side of the aisle you tend to support, there is no denying that the 2016 presidential election was one for the history books. Up until the moment the results were tallied, Hillary Clinton was the odds on favorite to defeat Donald Trump for the presidency. As we are all aware, things did not turn out as planned for Clinton. The shock of the loss had her and her supporters wondering, "What happened?!" In this tell all book, Clinton attempts to answer just that. I was immediately taken by how candid Clinton is. Several times during the book I found myself thinking that if she had been this open during the campaign, things might have ended differently. Say what you will about Trump, but he definitely has no reservations about saying exactly what is on his mind. Clinton admits to taking a more traditional approach to the process, playing politics by the rules. By her own accounts, she played that game quite well. The only problem is that Trump was playing a radically different game. Beyond President Trump's unorthodox and often ethically questionable political tactics, Clinton spends a good portion of the book commenting on the uphill battle she had as the country's first female presidential candidate. She writes, "In my experience, the balancing act women in politics have to master is challenging at every level, but it gets worse the higher you rise." Clinton considers herself to be highly qualified for the job of being the president. She served successful terms as both a senator and secretary of state. But she couldn't shake the criticisms of her clothing, speaking voice, and overall demeanor. While she may not have broken the glass ceiling, she writes of her hope that the cracks she made into it will make the task of breaking it a bit easier for future women. I found myself completely engrossed throughout the entire book. Clinton manages to mingle her political observations with deeply personal reflections about her journey. She writes with candor about the shock of losing a race everyone thought she would win. Despite her disagreements with the man currently occupying the White House, she seems hopeful about the future of the country. Whatever your political affiliations, What Happened is one of the most revealing books that was written this year. Clinton's firsthand accounts perfectly capture the events that helped shape the moment in history that we are currently in. 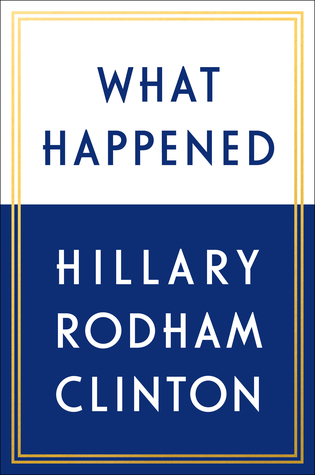 This entry was posted on Tuesday, December 26, 2017 and is filed under 2016 Election,Book Review,Hillary Rodham Clinton,Memoir,Politics,What Happened. You can follow any responses to this entry through the RSS 2.0. You can leave a response.